From day one, Revive! 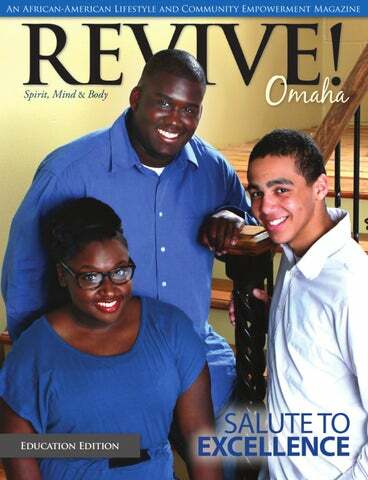 Omaha Magazine made a commitment to celebrate and recognize high achieving African-American students in our city. Please enjoy Revive! Omaha Magazineâ&#x20AC;&#x2122;s 4th Annual Salute to Excellence. Each year, we recognize African-American students in the Omaha Public Schools District that are achieving a grade point average 3.5 or higher. Most of the students have far exceeded a 3.5 GPA, with some achieving a 4.5 or more. We are excited to announce over 150 students are featured in the pages of this edition. We want to thank them for responding to our requests. For the record, there are hundreds of African-American students that are meeting or exceeding the 3.5 GPA. We celebrate all of them and encourage each to keep pushing forward and reaching for their full potential. The students featured were invited to a special Salute to Excellence dinner sponsored by Revive! 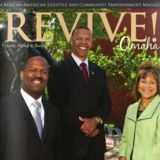 Omaha Magazine, ConAgra Foods, Wells Fargo Bank, the Empowerment Network, State Farmâ&#x20AC;&#x201C;Monica Rodriguez, and the Omaha Public Schools District. Thank you to all of our sponsors for helping to make this special edition and dinner possible. You are allowing us to live our dream to honor and recognize some of our best and brightest. REVIVE! Congratulations to all African-American students that are meeting or exceeding the 3.5 GPA. We celebrate all of you and encourage each of you to keep pushing forward and reaching for their full potential.